I have read parts of it before, certainly enjoyed reading the last few chapters. It's an excellent book to start with from Murray if you haven't read any of his books. It might be his most important work because it's a good introduction to 'early' social ecology and has been translated in several languages. He just seems a bit too positive about anarchism in it, athought it's clear that this work stands very much into the libertarian socialist tradition and isn't at all about being an individualist. This is one of those books I always thought I should fully read once, just after I had started reading it. I read half of it more than ten years ago. I think I picked it up again several times but found it hard to read further, so this time I started with the beginning of the book again and then later I could more easily switch to the second half of the book because it was more easy to grasp the logic behind it. I have read other stuff from Janet. This very long text was the most difficult one to read, it can be very philosophical sometimes, with words I did not find easy to understand so I had to take the dictionary and open it all of the time. It's also mostly about female writers, apart from Murray Bookchin, so it can be good for male readers who don't mind a bit of subcultural genderbending. The genderbending didn't fully scare me. I'm used to it because sometimes I go to feminist meetings of twenty or thirty people present, and then there can be just a few men there. If they want to be called men, that's not always the case either. One of the things I learned from this book is that ecofeminist Ynestra King has been less into social ecology than I thought she has been. Well, it's even harder to find texts from King in Belgium than from Janet Biehl, so... 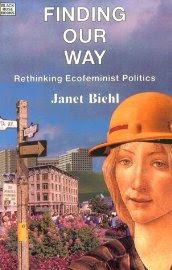 This book of Janet is the best work available to understand what's good about ecofeminism and what isn't. Something that I really liked reading from Biehl was this : "Let me make it quite clear that I do not contend that personal life must be sacrificed to political life. Quite to the contrary, I believe that the two of them have to coexist in a balanced, rational and truly ecological manner. Attention to the personal in itself is and will always be of great individual as well as social concern. Human beings have vital needs for self-expression, love, play, a relationship with a particular place, with nonhuman nature, as well as intimate relationships with other people." That an interesting book like this received little appreciation in the ecofeminist movement really is a shame, no wonder she doesn't seem to be much interested in ecofeminism anymore. It's an excellent work this book.